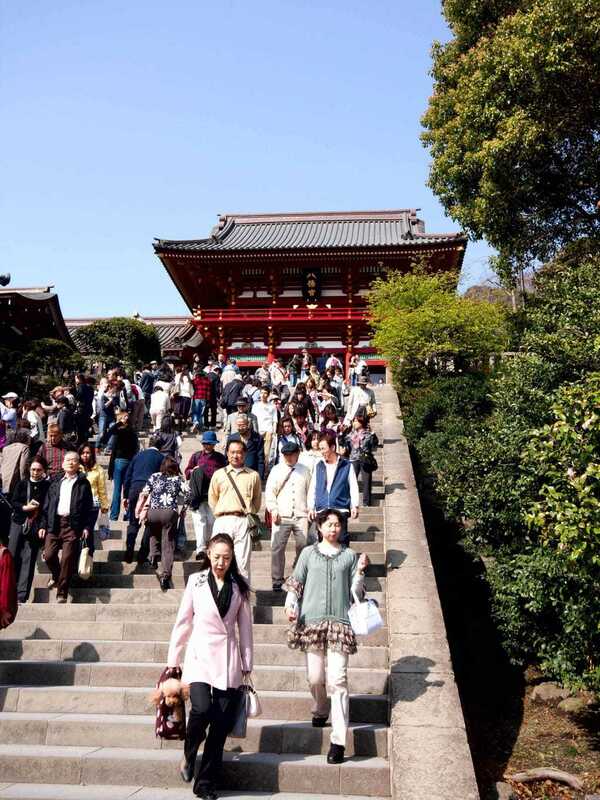 Tsurugaoka Hachimangu Shrine is a ‘must see’ destination on a trip to Kamakura. The site is historically and architecturally impressive in addition to its cultural value. 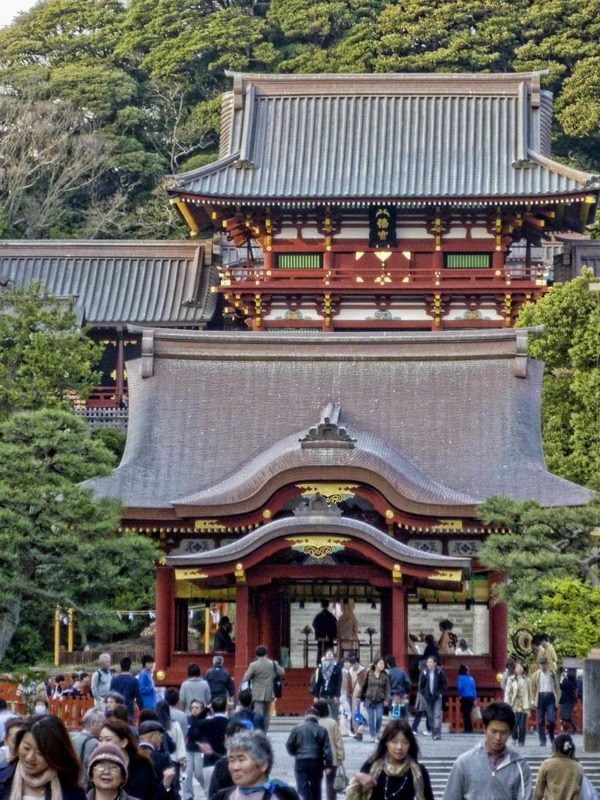 The Shrine was founded in 1180 for Yoritomo Minamoto, the first Shogun of the Kamakura period immediately after his victory and dedicated to Hachiman, his clans protective deity, and in Japanese mythology the god of archery and war . When the original shrine was destroyed by fire in 1191 Yoritomo immediately began its reconstruction which is the basis of what we see on the site today. From Kamakura station the shrine is less than a kilometre along an easy flat walk. We approached Hachimangu Shrine from the train station along the Dankazura. The Dankazura is a raised pedestrian pathway lined with 380 cherry trees that runs through the centre of Wakamiya Oji Road. 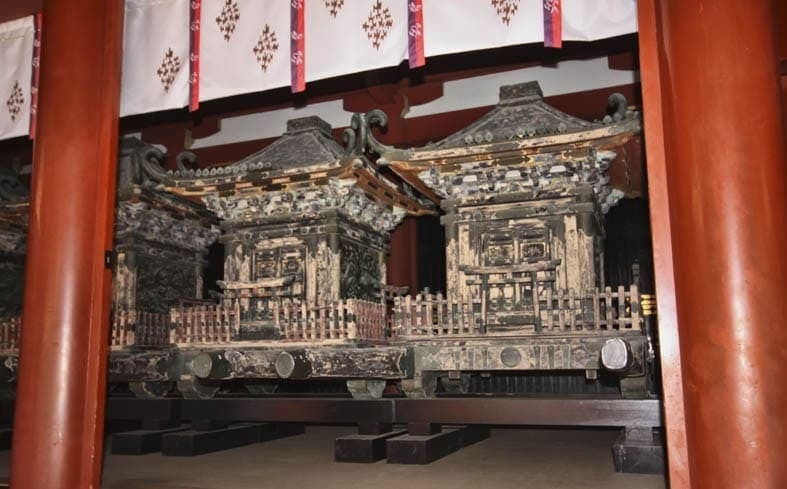 It was also built under orders of Yoritomo and dedicated to the Shrine in 1182. 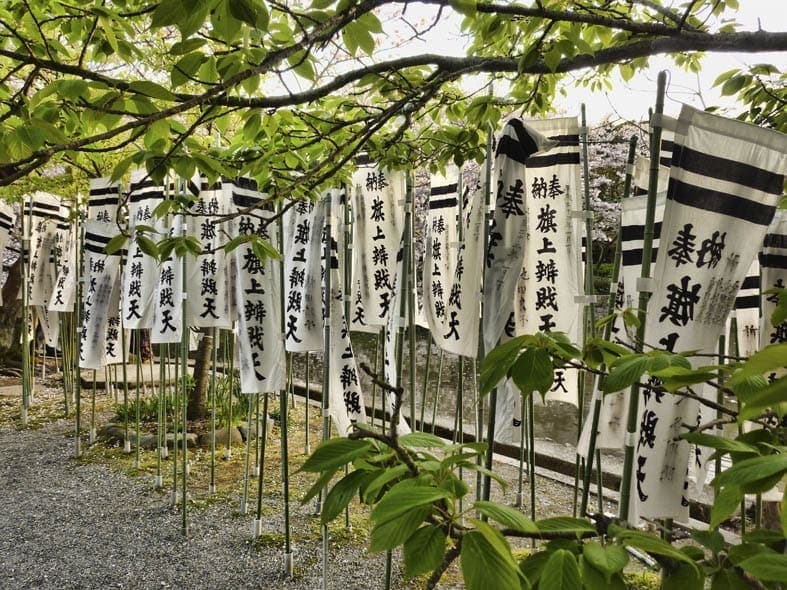 The dedication included a prayer that his next child would be a boy, later that year his wife gave birth to a son, Yoriie, who would become the second Shogun. In late March or early April each year the pathway is absolutely covered by the pink flowers and the faint fragrance of the cherry trees. 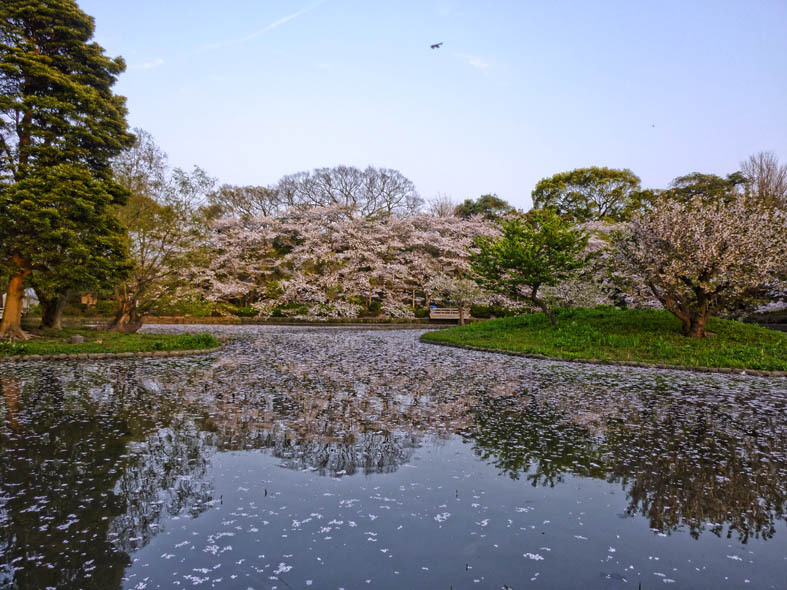 Sakura usually lasts less than two weeks in any one spot so this is a very popular time to visit. 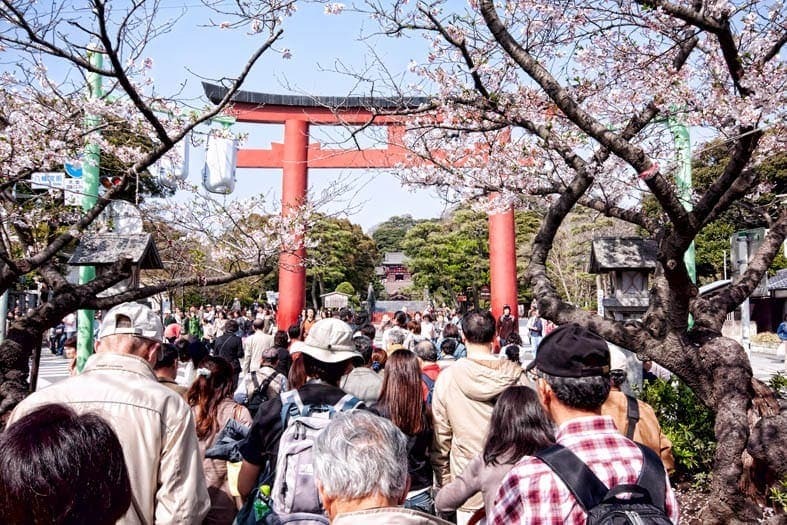 But gets more crowded as you approach the shrine gate. As you enter beneath the large torii gate marking the sacred ground of the shrine you cross over a bridge, once inside if you again head over a bridge to the right there are two ponds. I understand these are striking in summer with red and white lotus but in spring with the blossom in full bloom is also creates a striking and calm area. These are known as the Genpei ponds, Gen for the Minamoto clan and Pei for Taira Clan. It was a 5 year battle between these Samurai and the victory of the Minamoto that led to Minamoto’s rule and the beginning of the Kamakura period. Back across the bridge the wide approach to the shine gate and buildings continues. The Maiden, a ritual dance stage is shown in the photos below along with the 61 stone steps and the Tower Gate. These photos were taken in April 2010, a month earlier a 1000 year old Gingko tree that stood to the left of the steps fell down in high winds, the falling of the tree made national news, not only was the tree itself extremely old but it stood on the site where the third Minamoto Shogunate was stabbed to his death in 1219. If you look closely at the Maiden in the foreground of the photo you can see a bride and groom in traditional Shinto wedding finery on the stage. Spring is a popular time for weddings in Japan so I’ll post more Shinto wedding photos from around the country in a later post. The Tower gate looks similar in style to the one seen at many temples but the gate gardian at a temple would normally be the slightly scary looking Dewa Kings but at the shrine they’re statues of court nobles in formal attire made in 1624. I am absolutely blown away by the remnants of history we see every day in Japan. Maiden in foreground with Tower gate behind. Inside the Tower gate is the main hall comprising the Haiden and Honden. 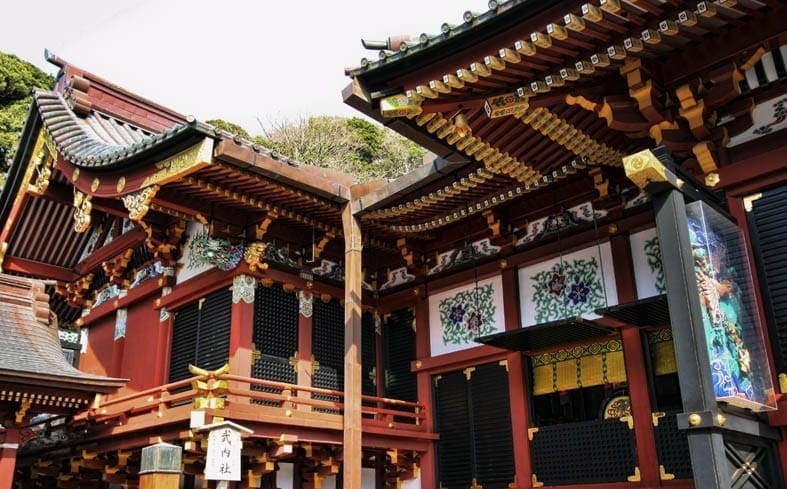 The Haiden is the oratory hall in front, and Honden the inner sanctum, which is the most sacred part of the entire Shrine. To the left of this building is the Treasure house, the picture below shows two of the portable shrines displayed there dating back to the 17th and 18th centuries. 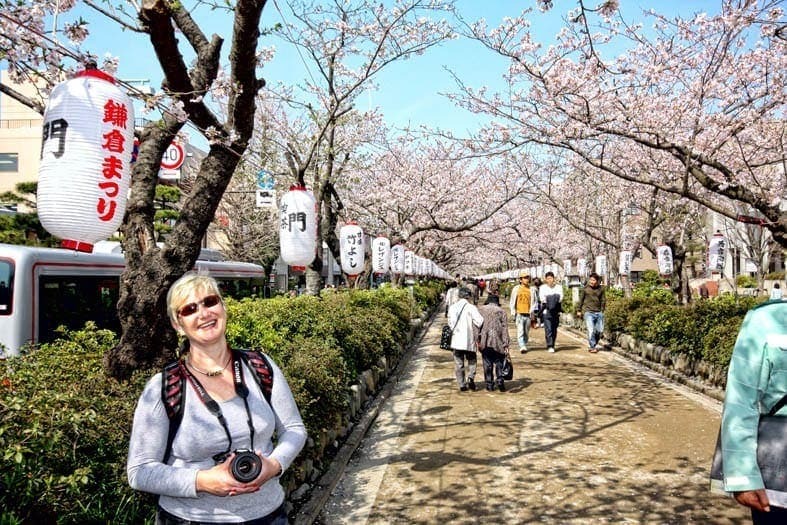 We’ve really enjoyed our visits to Kamakura and nearby Enoshima and would recommend a visit to the Hachimangu Shrine to anyone who’s visiting the area. They are two of our top day trip destinations for Tokyo.